The path that led Dokka Umarov to the Moscow subway bombings was neither straight nor straightforward. Only a few years ago, he saw himself as a Chechen patriot – in Islamic fundamentalist terminology, a “nationalist”. In the realm of Islamic faith he was a follower of the Sufi traditionalism of Sheikh Kunta-Khadzhi. It would, however, be mistaken to suppose that he opposed the use of terrorist attacks on principle. Like many others, while encouraging the activity of Shamil Basayev, he did not want the Chechen resistance to bear responsibility for the death of civilians. Ever since the hostage drama of Budyonnovsk it had been the Ichkerian leadership's practice to condemn methods of terror and to point out that they were applied by a unit which since 2002 had acted more or less on its own initiative – the Riyad-us-Salihiin “brigade of martyrs”, founded and led by Basayev. Many Chechen insurgents did not feel morally justified in becoming involved in attacks which targeted the civilian population, including children. They repeatedly expressed their dissatisfaction with Basayev’s bombing campaigns and other operations. Presidents Aslan Maskhadov and Abdul-Khalim Sadulayev could not ignore these sentiments – indeed, since they counted on the sympathy of the West and of human rights activists, the two presidents could not be seen as directly linked to terrorist activities. Nevertheless, even after his appointment as Ichkerian vice president Basayev continued to be one of the most influential commanders of the armed insurgency. These tendencies were underlined when Dokka Umarov became President of the ChRI. The very first document he signed n his new role was the Statement of June 26, 2006. Curiously, this document does not exist today in the archives of Kavkaz-Center, where there is only a brief summary omitting the final, crucially important part, though it contains a dead link to the excised passage. The passage which Kavkaz-Center did not deem worthy of mention reads as follows: "... “I declare that the goals of our blows and attacks will be exclusively military and police objectives. Regardless of the fact that the Russian occupiers have been engaged for many years in genocide against the civilian population in Chechnya and the entire territory of the North Caucasus, I, like my predecessors in the office of President, will resolutely oppose any attacks on civilian targets, except for those individuals and structures that, concealing themselves behind their civilian status, conduct sabotage and undercover operations against us." It may be assumed that the entire text of this document was prepared by the ChRI’s then Minister of Foreign Affairs, Akhmed Zakayev, who sought the support of Western countries, and that the passage banning attacks on civilian targets was directly at variance with the interests of the Salafi jihadists. However, on the very next day Umarov demonstrated that in practice he intended to be guided by other principles. On June 27 he signed the decree that made Basayev vice-president, but two weeks later Basayev died when his truck was blown up at Ekazhevo. The "Year of the Offensive", as Umarov called it, was now underway: the summer of 2009 witnessed a record number of operations, involving more suicide bombers than ever before. Shahids carried out more than 20 bombings in Chechnya and Ingushetia, killing dozens of Interior Ministry personnel and senior police officials. The number of civilian deaths also began gradually to increase, as casual bystanders were also killed in the blasts. The final stage in the development of the new terrorist strategy should be viewed as having been reached in late 2009, with the bombing of the Nevsky Express passenger train on November 27, in which 27 people died. 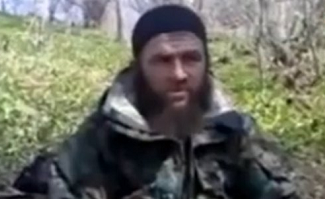 A month later, Kavkaz-Center posted a video message from Umarov in which he confirmed that the bombing of the train had been carried out on his direct order, and was "only the beginning:"I, the Amir of the Caucasus Emirate, am based in Chechnya, and the Jihad in the Caucasus and the operations in Russia are being led entirely from Chechnya. " As we can now see, Dokka Umarov was being quite consistent and did not throw his words to the wind. After the bombing of the Nevsky Express, fresh attacks were to be expected in Russia. It was, moreover, not hard to work out what direction they would take. Bombings in small Russian towns like Bryansk obviously had less resonance for the terrorists than similar operations in Moscow or St. Petersburg. It was therefore not too difficult for experts who know the situation in the Caucasus to guess who was behind the explosions in the Moscow subway, though there was some uncertainty as to how quickly Amir Dokka would claim responsibility – after all, in the case of the Nevsky Express it took him a whole month. But this time Umarov showed himself to be a model of efficiency. Two days after the March 29 bombings the Hunafa.com website posted his video. Why, if the mujahedin and their Amir no longer take any steps to conceal their intentions, is Russian society so unprepared for war and terror on its own territory? (For it appears that no one expected the Moscow bombings.) Why do Russia’s government and people ignore the threats that openly resound in their ears? Probably because they still regard those threats as empty ones. Meanwhile, in this latest video Umarov promises "the Russians" that "our operations will continue on your territory." And that, in response to the deaths of his comrades on February 11, "special measures" will be taken to launch a new operation, which "you will soon see and hear."